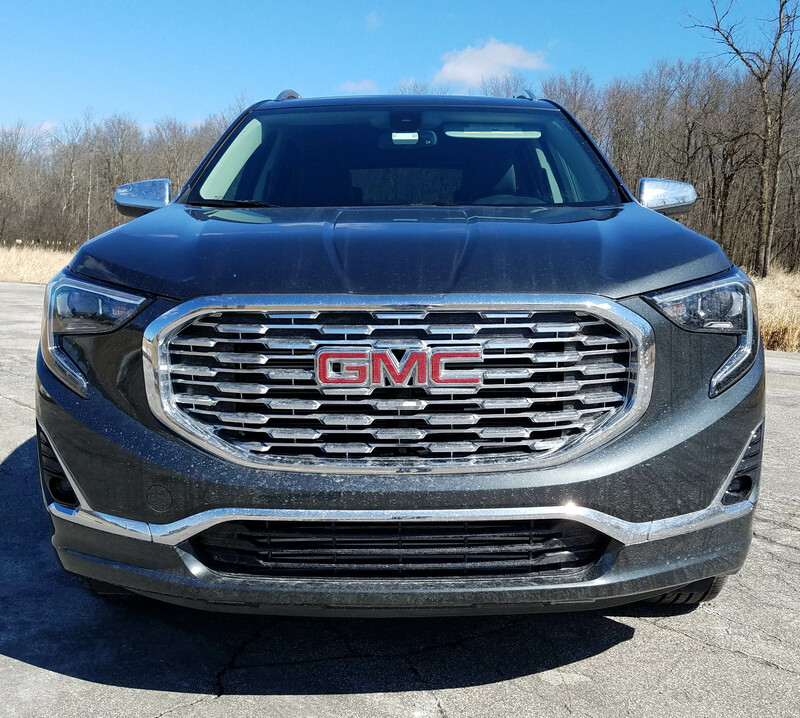 Terrain is virtually the same vehicle as Chevrolet’s Equinox with a bit boxier styling, but much improved from the previous model. Mine was a dark gray metallic with all-wheel-drive and was GMC’s top trim, the Denali. What that means is more chrome (grille, mirrors, rocker panels) and a well loaded standard vehicle, although this one still managed to add a couple option packages. Even at that there was no sunroof, nor smart cruise control. 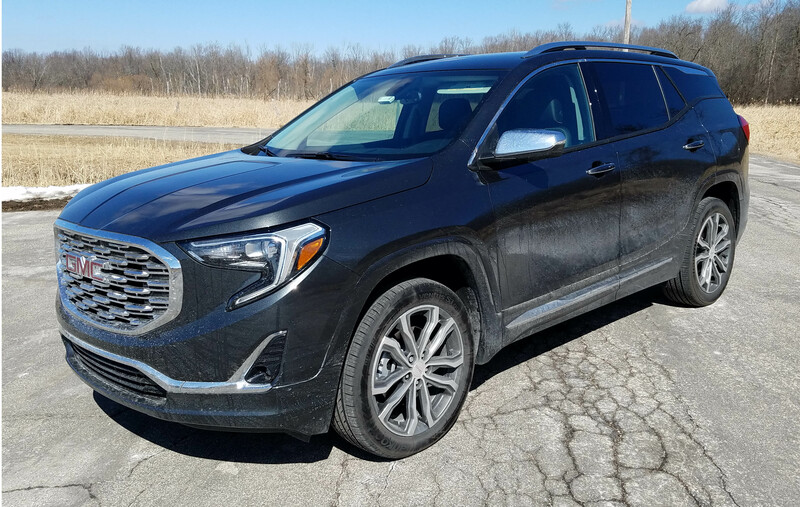 Terrain is comfortable and roomy enough for a family of four to take a trip, like a mid-size sedan, only it rides higher and this model comes with AWD for those times you plan to go mudding or somehow run out of road. Power is good from its 2.0-liter turbocharged I4 engine. Heck the Denali’s turbo churns 252 horsepower and a healthy 260 ft.-lbs. of torque. Getting up to highway speed is easy, but be warned that the turbo has major turbo lag. So when you let off the gas to turn a street corner, you can press that gas pedal, but will wait a second or so for it to boost your acceleration. Ride also is nice. 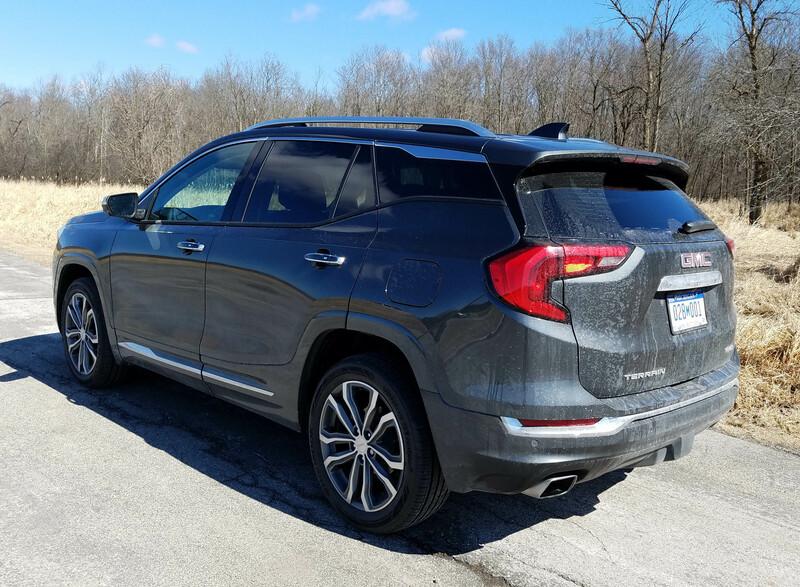 The Terrain runs on a 107.3-inch wheelbase and its suspension is tuned well to control the ride. No jarring or twitching here. 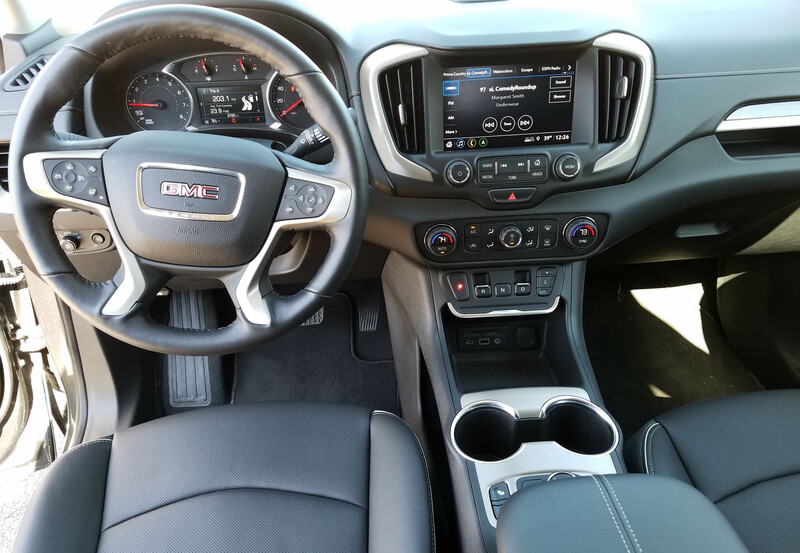 Adjusting the AWD system is handled easily through a knob on the console, with 2-wheel-drive the default setting that will keep your gas mileage optimized on the crossover. Turn the knob once to standard AWD and then another notch to the low setting, most likely needed for rutted off-roading. 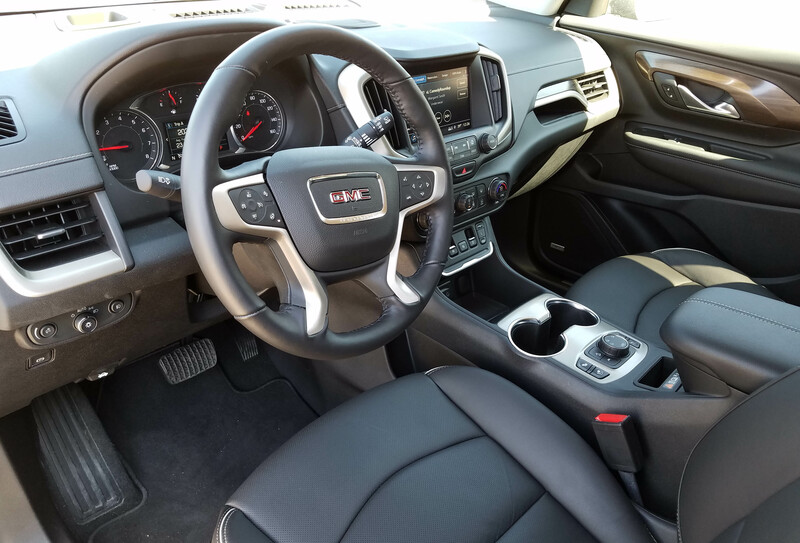 I like GMC’s 9-speed automatic transmission too, it shifts smoothly and seems well mated to the small turbo engine. Terrain’s handling is fine, with a bit of body lean in tight, fast corners, and the steering wheel feels fairly numb, like so many crossovers, utes and trucks. Inside, the gray test ute featured a black leather interior, seats including light gray stitching and piping to soften the dark interior, along with a gray headliner. The dash and doors are black too, but a harder plastic than I was anticipating in Denali, since it aims more at luxury. There’s brushed chrome trim, so it isn’t too reflective on sunny days, a benefit to a driver’s eyes. It trims the heat vents, center screen, and steering wheel hub. There also are fake wood inserts in the doors. I found the seats a bit snug, especially the bottom cushion while the back offered decent side support. The bottom cushions also are short. I had several taller riders complain that they felt thigh support was lacking. The rear seat was roomy enough though and riders there had no complaints, although several asked where the sunroof was. I too was surprised that a top trim Denali had no sunroof while so many other utes and crossover are now offering two, or often one giant panoramic sunroof. Dash layout is fine and the buttons and knobs are large and easy to use when wearing gloves. One oddity though, gear shifts are handled through a series of buttons at the bottom of the center stack, just above the console. Park and Neutral were easy push-buttons, but Reverse and Drive were toggles that required the driver to slightly pull each button toward him or her. I’m sure it’s easily accomplished in warm weather when not gloved, but if you have thick gloves, well, I feel the finger hole for Drive and Reverse could be a bit larger. The upside of the Denali is its heated front and rear seats, plus cooled front seats too. There are three temperature settings for each. The crossover also features a heated steering wheel, a comfort on chilly mornings. The power seats also have two memory settings for the driver’s seat and the steering wheel is a manual tilt/telescope model. When starting the car an extremely loud chime gongs you awake to warn that seat belts need buckled. While all vehicles do this, the sound here urged me to cover my ears until it faded to a distant memory. I wish all of these would wait until the vehicle is placed into gear to issue their warning. Many of us in northern climes start our cars and then get out to scrape the windows in winter and a chime is just extra noise until we’ve resettled and put the car in gear. Likewise the GMC issues a loud chime warning when the car is turned off, reminding you there MAY be something in the rear seat. A message also lights up on the dash. My grandson was in back, but it was unlikely I’d forget to let him out when we stopped. This warning might be helpful when a package is on the seat, but otherwise, again, just unneeded noise. On the bright side, the Terrain features sun visors that slide, and an SOS system and HomeLink overhead. Likewise there’s a power rear hatch, storage under the cargo floor, plus a Bose sound system with seven speakers. The infotainment screen is 8 inches, maybe a touch small, but easy to see and use. And Terrain has the usual safety devices found on most vehicles now. There was blind-spot warning, lane departure, emergency low-speed braking and forward collision alert. Much of that comes in a $495 Driver Alert package, but smart cruise control isn’t. 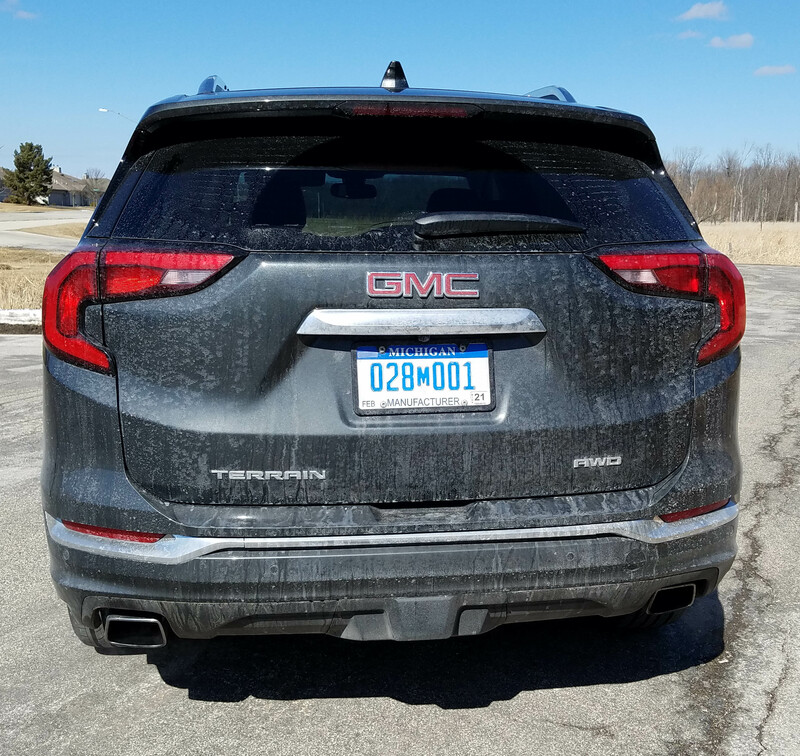 In fact, GMC doesn’t offer it on the Terrain, even as an option. I’d prefer it over lane departure control to be sure. The paint color was an extra $395 here too and the Comfort package at $525 included the cooled front seats and heated rear seat, plus wireless charging in a vertical slot partially under the front seat’s center armrest. Gas mileage is about what you’d expect, the EPA rating this one at 21 mpg city and 26 mpg highway. I got 22.9 mpg in about a 50/50 mix. You can improve on that by going with the base SL model, which is front-drive only and features a 1.5-liter I4 that makes 170 horsepower. It’s rated at 26 mpg city and 30 mpg highway and starts at just $25,990, including delivery. There are a lot of models here, SLE, SLT and Denali, all with either 2-wheel drive or AWD. Plus there’s a diesel option in the SLE and SLT models. The 1.6-liter turbo diesel creates 137 hp, but delivers a monster 240 ft.lbs. of torque. It also is rated 28 mpg city and 38 mpg highway. Be aware that diesel fuel is considerably more costly than standard unleaded. 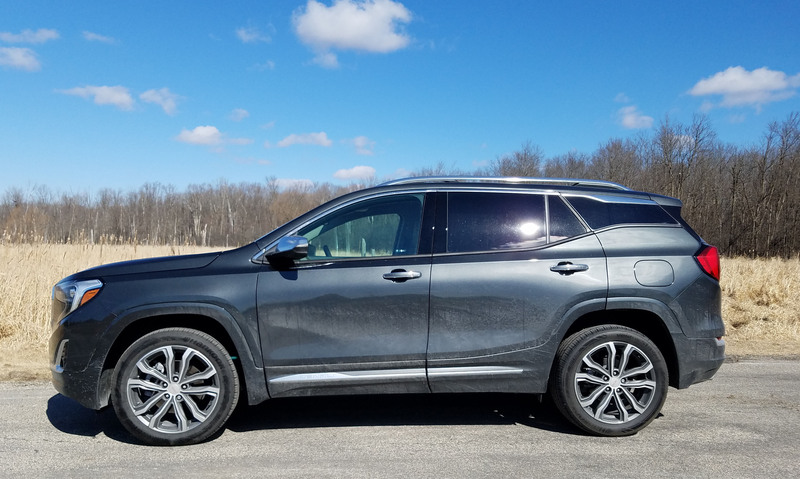 Cost for Terrain begins at the low entry level with the SL, but grows to $40,245, including delivery, for the tested Denali, The test vehicle ended up at $41,660 with its three options. There’s much to like here from a driving perspective, but the crossover market is only expanding and the competition is fierce from the likes of Toyota’s RAV-4, Nissan’s Rogue, Mazda’s CX-5, Subaru’s Forester, and Honda’s CR-V. Drive them all before settling on one. Misses: Loud chime when car started and annoying rear-seat warning chime and dash flash, even if nothing in rear seat. Major turbo lag, no sunroof, odd transmission buttons and toggles at bottom of dash’s center stack.